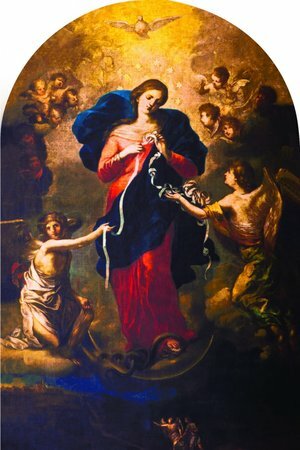 Here’s Day 9 of The Our Lady, Undoer of Knots Novena! Please pray for Louise – a 91 year old lady dying of breast cancer. She is experiencing spiritual distress due to her unresolved grief of the death of her 2children. She is angry at God and unable to accept her disease and death. Please pray that she can find peace and see this as an opportunity for reconciliation and preparation for Eternity. Thank you. I just got in on the last day of the Novena, however I know the Blessed Mother works in many ways through our Lord, Jesus Christ. I’m in desperate need of some financial assistance this month to pay my rent, and I’m seeking a miracle. Thanks to all of you for praying for me and my intentions. God Bless all of you. I ask that you undo the knot of homelessness I have suffered with for too long. Please Mary, together with my father God and Jesus the good Sheppard. I pray that with all our love combined, that I have a home to call my own, by this Sunday 6th May 2018. Dear Blessed Mother, Undoer of Knots, please hear my prayers for my son Paul. Please help him pass his last two CPA exams after a few failed attempts. He is a good son and a good student. Please undo this current knot in his life for the greater glory of God. Mary Undoer of Knots please untie all the knots marriage to Paul and block all the interference from outsiders. Please bless our children with relief of stress surrounding our separation and destruction of their family. Please bless continue to bless our grandmothers with good health, strength, and faith. Thank you for all our opportunties for a good life and fill our family with gratitude and hope for families and marriages. Please join us in prayer to help us with the sale of our home in Houston, Texas. It flooded during Hurricane Harvey and we are selling it so that another family can love it as much as we have. Thank you and God bless! Holy Mother, you know the heart of mother how it wrenches and cries out to see her son suffering. I beg you to undo the knots in my son’s life with medical school applications. Undo the knot in CAUSM school and please make this happen that he gets shortlisted for sec app today, and then accepted. Please Holy Mother take my petitions to Father God AND Jesus Christ as your personal prayers and ask them to fulfil this miracle for my son today. Thank you Holy Mother for hearing all my novenas and prayers. and her parents. Thank you, most merciful Mother of God! Mother Mary please untie the knots for students taking final exams. Please untie the knots for Mike who is having surgery today to remove a blood clot from his lung. Thank you for hiding me in your Immaculate Heart, and drawing me to a deeper life of prayer while my body recovers. Thank you for undoing of knots in the lives of those dear to me, and keeping us all under the mantle of your protection. Queen of All Saints, Seat of Wisdom, Star of the Sea, I entrust my life and all the merits of this novena to you and your glorious Spouse. You are beautiful, holy, perfect in trust and full of peace. ??? Jesus, we trust inYou. Jesus, we trust in You. Jesus, we trust in You. Amen. MOTHER MARY I AM SUFFFERING FROM A STROKE PLEASE HELP HE ITS BEEN A LONG TIME PLEASE,PLEASE HELP MY MOTHER VIVINNE AND FAMILY AND FAIMILY AMEN. Blessed Mother improve my health and that Keith can also improve if l help him without rows. In the name of the father. Amen. I pray that my kids be removed for the things that is keeping them back in life. I lift up my financial situation. Mary undoer of knots please untie all the knots that is blocking the flow of my finances today. Please bless my children and my family and keep them safe. I pray that my children be successful with their studies with their exams and studies. Please bless my family. Mary undoer of knots please untie the knots of all my enemies. Mary undoer of knots please untie all the knots that is blocking the flow of my finances today. Please bless my children and my family and keep them safe. I pray that my children be successful with their studies with their exams and studies. Please bless my family. O Mary, Undoer of all Knots great and small, please undo the knot of anger from my wife’s heart, and through your Son restore our marriage, so it brings glory to God. Amen. Our lady May my surgery be successful, I pray for unity with my siblings and a permanent job for my son Amen. Dear mother Mary please I still continue praying for my incoming nursing board exam dis coming June 3and 4…Help me guide me give me retentive memory more knowledge and got focus and concentration while I’m reviewing in preparation for my exam…Lord God help me to have 88% in my exam…I trust you and I love you..Amen…. Dearest Mother, please keep my family safe with safe housing. Please also help brother Bob and sister Mary in their tribulations. And thank you Mother for your many gifts, we are grateful.